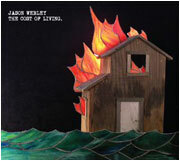 Album: "The Cost Of Living"
Review: To those of you not familiar with Jason Webley's music, he sounds something like a mad gypsy pirate growling drunken prophecies from a ship teetering on the edge of the world. In other words, he's somebody you should be listening to. His fifth album, The Cost of Living, is his most ambitious to date, with sweeping strings and bombastic brass backing up and adding plenty of texture to his usual accordion and guitar. It's a little more "epic" than his usual folkier sound, which is neither a good or a bad thing--simply different. It's a perfect album for those fall and winter nights when the world feels kind of beautiful and sad at the same time. "Still" starts off the album with a sense of building urgency, with hectic strings kicking in toward the end, shortly before he informs us that there's "still more to come", which, based on the quality of this song, is a most welcome thing. "Ways to Love" is a song he always jokes sounds like "Purple Rain" when playing it live, which starts off fast and later builds to a more frantic tempo, exploding in a climactic vocal frenzy I never get tired of hearing. The next few songs slow down the pace a bit, and are beautiful and melancholy as they explore topics like saying good-bye, loneliness and desperation. "Meet Your Bride" is another one that starts off slow and relatively quiet, but by the end Jason's emotional, booming voice is demanding to know how you will approach the love of your life. "Clear" starts with a desperate strumming, and goes into these discordant bits featuring galloping percussion as Jason asks "Where are the angels now?". "Little Sister" is another frantically paced song featuring wild accordion playing and a distinctly Eastern European sound. "Back to You Again" is a sweet and beautiful song, the music and lyrics of which both summon vivid feelings of warm nostalgia. And finally, "There's Not a Step We Can Take That Does Not Bring Us Closer" features dueling strings and brass and is an affecting closing statement about the journey of life. Webley's work has often been compared to the likes of Tom Waits, Leonard Cohen, Neutral Milk Hotel, Bob Dylan, and Nick Cave (in sensibility if not necessarily in sound), but you can't really say he sounds like any one of those artists individually. It's safe to say that if you like the work of those kinds of songwriters with stories to tell and substantive lyrics that easily traverse the gap from humorous to melancholy, then his work will connect with you like an old and familiar friend. If you enjoy this album, you should definitely check out his previous four, which aren't "stripped down" so much as this one is "built up". Also, I should advise you that if you ever have a chance to see this man play live (he tours widely and often), do not pass it up. At five times, I have now seen this man perform more than anyone else, and he never disappoints. He plays with such passion and force that its easy to forget that he's alone on the stage--it's almost as if your mind simply fills in the band behind him to account for all that energy. And every show is different, as he'll do random, fun things like play cheesy 80s songs or play older audience-requested songs from memory, even though he might not be completely comfortable doing it. He also encourages a tremendous amount of audience participation that eventually draws in even the most firmly planted wallflowers. He connects with his audience like few others I've seen. He's a true performer in a way that feels like it hearkens back to a centuries-old art that's almost lost to us, but for a handful of people like him. I´ll tell you when it arrives, delivery in 1 to 2 months here in Middle Europe. ok I stornoed the hard copy order and simüly downloaded it via Amazon mp3 and I´m really glad I did. I like that album immensly, thanks for the tip! I´ll try to get his previous records. I always like your reviews on here Protoclown. Either its something I already know and love, or its something I will seek out and probably love. Keep up the good music reviews. I look forward to them.